As a guy from Indiana, I grew up in the Bob Knight era. If you were a fan of the Indiana University Hoosiers during his tenure there, you know he was pretty adamant about not calling timeouts to stop an opponents run. He believed that you should use good execution to stop it. 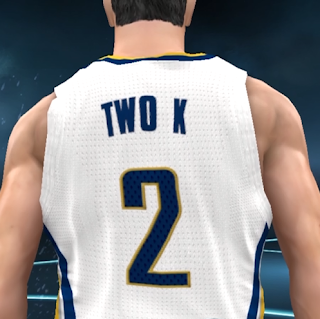 For most of my NBA2K career, I've also adopted that stance. In part because I was a Knight follower and also because it's kind of a joke in the 2K community that you need to call timeouts to stop either a human opponent or the HOF CPU even though you don't. Lately, I've started to question how I use timeouts mainly because I find myself in games versus opponents where we can go a whole quarter with no break and so I'm asking myself how realistic is that and should we be calling timeouts? Here is the section in the NBA rule book that talks about timeouts. I know in NBA2K, you start the game with 7 timeouts. You have the option to call a full timeout or a 20 second timeout with the limit on the 20 second timeout at one per half I am pretty sure. I typically never call a 20 second time out and opt for full timeouts most of the time. In real life, there are tv timeouts. These are "mandatory timeouts" that are called at the first dead ball after 6:00 and 3:00 in each quarter and there was another situation when tv timeouts would be called but I didn't have the energy to figure it all out. It also seems that in real life, towards the end of the game, there are often a bunch of timeouts. 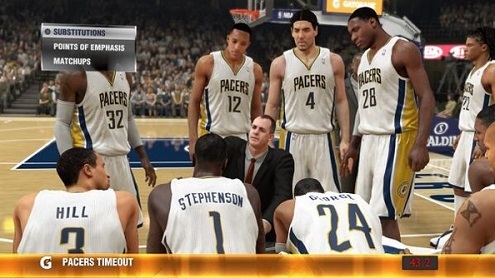 As I mentioned above, the joke around the 2K community is that you should call a timeout to stop a run. The thinking is that it will stop a team's momentum. I think most people think the mere "act" of calling a timeout is what stops the momentum. In actuality it's the execution after a timeout that matters. If you don't execute, then it doesn't really kill momentum. So let's look at times when you want to call a timeout. When a team makes a big play. If a team makes a big play like an alley oop dunk or a huge three and you can hear the crowd start roaring, this is your sign that maybe a timeout might be in order. If you opponent goes on a run. If you can't stop the other team for several possessions, that's another time you might want to use a timeout. When your opponent scores to stop your run. I've noticed the CPU does this and often I will do it too if I score a bunch of buckets and the other team answers. To avoid a turnover. Often I'll get caught in the back court with a big man dribbling and no ball handler near. I'll advance it if I can but if it's likely I'll turn it over, I call timeout. I just have to remember to get the ball past half court before the 8 sec violation after the timeout. I also might need to call timeout to avoid a 5 second call. To make an adjustment in POE or matchups. If you feel you need to make a defensive adjustment and can't do it on the fly, that's a good reason to call a timeout. While you can make a matchup change in the pause menu, I prefer to do it during a timeout if possible to hide what I am doing. You might want to check the stats and just take time to think about what's going on and how you want to deal with it. To make substitutions. Sometimes I need to make a complicated substitution that is hard for me to d pad through during play. I usually will call a timeout to take care of it. To rest your team. Often fatigue creeps in. It might make sense to call a timeout to give them a rest so you can leave them in longer. To stop the clock. Towards the end of game, you might need to stop the clock and that's a good time to call timeout. To advance the ball to half court. If you don't advance the ball, at the end of the game, you can call timeout and take the ball out at half court. To take care of something while you are playing someone. I've been known to go to the bathroom during a game since they last an hour they way I play them. Sometimes I'll have a controller issue I need to fix. I've often had the game not respond and I'll have to burn a timeout to try and reset my controller. It's often more courteous to call a timeout than pause it. If I need an extended break for some reason, I'll let my opponent know what's going on as well. Those are some good times to call timeouts even though guys often save all of their timeouts until the end and can't use them all then anyway. To call timeout, you can either pause the game and select timeout from the menu or on the Playstation, you can just hit R1 and L1 at the same time. Then you select what kind of timeout you want. You can choose either a full time out or a twenty second time out if you have used it yet. What Do People Really Do During A Game Of 2K? That's the basic primer on timeouts. So let's talk about what happens in game situations sometimes. There are basically two types of players. Guys that set the timeouts to auto and let the computer handle it and those who don't. If you have a guy on auto timeouts, then you won't see a problem with no breaks in play. If you do set your settings to auto timeouts, you might hesitate before you call a timeout manually. I have often called a timeout only to have the auto timeout called right after. Never call timeouts. First, you'll have guys that won't call timeouts. The thinking is that they can sub on the fly and if you are not doing that, your guys may get tired and this gives them an advantage. If you get two stubborn people together, and that also don't reach or foul, you can find yourself in long stretches without a break in play. Call them at appropriate times. Some users do take the time to use their timeouts effectively to manage the game. Call them late in the game back to back to rest guys. Another thing I see is people using timeouts to avoid subbing. I've noticed some guys will call back to back timeouts to keep their players fresh. I don't really like this but it is an option if you are not a very deep team. Abuse the timeout. I've also seen guys call back to back to back timeouts. The reason? Because they heard it's a glitch to break momentum. I definitely don't recommend the double or triple timeout strategy. Do I want to make any subs. Are my guys tired? Is it time for a break. Do I want to go small, go big or in late game situations put in three point shooters or free throw shooters? Do I want to change my points of emphasis? Is there anything my opponent is doing that I need to try and stop? I might want to adjust my points of emphasis coming out of a timeout. Check stats. I think it's perfectly fine to check stats in during a timeout since they don't make them available during the timeout. Do I want to change a matchup? Towards the end of a game, I might want to put my lockdown defender on the other teams best player. This is the time to do that. Take a breather. I typically rest for a bit as well. I often don't adjust anything. If the game is going how I want it, I might not make any adjustments and just rest. If you could consider yourself a sim type player, where you are after realism, I think it's probably essential that you call timeouts. I don't think it's really fair to criticize someones on court play and then not call timeouts like you are supposed to. If you forget to call timeouts, then you might want to put them on auto. Here are some other suggestions for being more sim with timeouts. 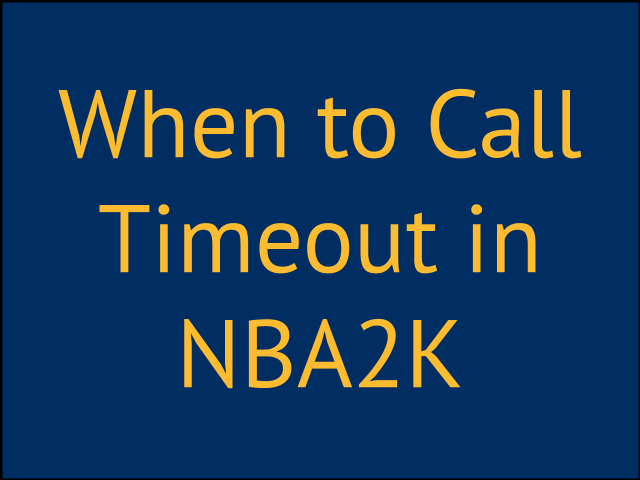 Call timeouts regardless of whether you feel you need to it at times when mandatory timeouts would take place in real life. Let the timeout run for the whole time. If you are calling timeout after a big play, advance the ball to half court then call timeout. Regardless of what you do, I think it's important to save at least two timeouts for the end of a game. You might need them if the game turns out to be close. Is it critical to think about this? Well it depends on your level of sim and how far you want to take it. Depending on my opponent and my game plan, I've started calling timeouts at certain breaks and at times listed above. So, I've changed my approach a bit from when I started just to be more realistic. Let me know how you guys approach timeouts below. i usually call time out at the 5-min mark (11-min game play HUMAN to CPU) to sub a big man (eg. Sacre) or old player (eg. Kobe) who usually expend his energy faster than normal guys at the first quarter. however, i realise CPU most of the time would do that and so, i will call time out a few moments after the CPU called it. this is because for most of the time, the CPU will pick up its momentum and score on me fairly successfully. i will need it to stop their momentum. it is during this time i will sub most of my starters out and leave one in the game. when comes to the last 1 min of the quarter, i will have my second unit to play until late second quarter (or 4th if i'm at second half). this strategy allows my star player to be fresh and capable to score with high shooting percentage when he's on the floor. however, i can hardly score more than 50 points for my star player.